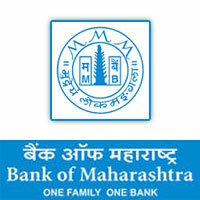 Bank of Maharashtra Jobs Recruitment Notification 2018.Bank of Maharashtra inviting applications for the positions of CA/ Cost & Management Accountants Posts.Interested and Eligible candidates can apply for the positions. Last Date for Submission of Application is on September 23rd, 2018..
Total number of vacancies to be filled in Bank of Maharashtra is 50 for CA/ Cost & management accountants. Graduation degree holders with professional qualification of CA/ Cost Management accountants (ICWA) from a recognized university can apply. For general/UR candidates the age can be in between 20 to 30 years. On basis of candidates performance in interview they will be recruited. Mode of applying for Bank of Maharashtra recruitment is through online mode from 03rd September 2018 to 23rd September 2018.
https://www.bankofmaharashtra.in/Current-Openings.asp is the link for contenders to apply directly.